The MHA Keystone Center presented the quarterly MHA Keystone Center Speak-up! Award Feb. 20 to Danielle Gebolys, RN, a nurse at Beaumont Hospital, Dearborn. Gebolys is the first recipient of the award at Beaumont Hospital, Dearborn. Gebolys identified a misdiagnosis of a patient’s medical condition and voiced her concerns to colleagues. A misdiagnosis, if not identified, can result in incorrect treatment and patient harm. “If you feel that you can prevent harm in any type of way, whether it’s related to patient, staff, or your own safety, I would recommend that you say something and speak up,” said Gebolys. The award was created to celebrate individuals or teams in MHA Keystone Center Patient Safety Organization (PSO) hospitals or health systems who speak up to prevent potential harm to patients or other staff members. 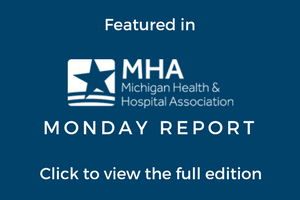 The MHA was proud to recognize Gebolys’ efforts for speaking up and Beaumont Hospital, Dearborn, for encouraging a culture that supports healthcare team members to raise concerns about the potential for patients to be at risk for medical error. safety efforts and the importance of speaking up when witnessing a potential adverse event to improve patient safety and the quality of care. Beaumont’s mission is to provide extraordinary care every day. As part of its mission, Beaumont is committed to being transparent about the quality and success of its care. Beaumont Hospital, Dearborn, began its journey toward a culture of safety in 2015. Since then, it has created a robust reporting system and honors staff with various awards for reporting near misses and speaking up to prevent staff and patient harm. Photo Caption: Danielle Gebolys, RN, was recently presented with the MHA Keystone Center Speak-up! Award at Beaumont Hospital, Dearborn. Shown (left to right) are Sam R. Watson, senior vice president of patient safety and quality, MHA; Raj Goswami, DO, patient safety officer, Beaumont Hospital, Dearborn; Gebolys; Brian Peters, CEO, MHA; and David Claeys, president, Beaumont Hospital, Dearborn.